To Label-Expo, will demonstate our RFID embedding machine with Bad Tag rejection | Fanatic Attack: enhancement of curiosity. I’m headed to Label-Expo next week, where we will reveal Worldlabel Holding’s xTrack v5 RFID smart label converting machine to the USA. 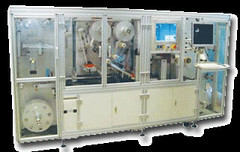 Its very exciting, as the machine is state of the art and has the most advanced features in the industry. It is quite innovative, and the bad tag rejection online is especially cool. Other machines cannot do it, as they embed bad tags into the labels and then mark that label with a ink pen as bad. xTrack V5 is able to inspect and embed only Readable & Writable RFID tags during the RFID label conversion process. All rejected RFID tags are reeled back and will not be dispensed. The machine is flexible enough to accommodate a variety of label sizes and all types/brands of RFID inlays to be accurately embedded in the label and any where in the label you want. Xtrack v5 machine will produce a roll of RFID Smart labels 99.999% readable, whereas others produce only 80% readable. It can make almost any size smart label, and the turn-around time is quick. Even those RFID baggage tags you will be seeing at an international airport near you soon, can be made with xTrack V5. Of course, as RFID becomes more relevant in our daily lives, some social issues and definitely serious privacy concerns will become real. We will have to address them. The privacy issues are complicated, but with passive, semi-passive and active tags, only certain types of these tags/chips could become an issue. So how does one address all the privacy concerns? What can you do to protect your privacy from a RFID invasion? Not much at the moment! One thing you can do now, if you know there is a RFID tag/chip in the item you just purchased, is to ask the merchant to deactivate it. One solution – one I hope the RFID system integrators and sensor manufacturers can work on, so that privacy fears will diminish – is to develop sensors which read the tag on exit once and then automatically delete/damage the tag. Disclaimer: The postings on this site are my own and do not necessarily represent Worldlabel Holding PTE LTD positions, strategies or opinions. This entry was posted in News, Science and tagged label converting, label expo, labels, radio frequency, rfid on 5 September 2008 by Russell. That’s awesome. Can we get these RFID tags for lunch boxes and water bottles? My kids are always losing them at school.